Confession: I'm not a very organized person. Based on my personality, I feel like I should be organized. I desperately want to be organized. But, no matter how hard I try, I'm just not. That being said, I set my mind to getting my closet in order this past weekend. Inspired by the cool fall weather, I lugged boxes of woolly winter jackets out of storage. I packed my light floral frocks away. I filtered out as much fluff as I could. It took the better part of a Sunday and is not perfect, but it's much improved. This is the first outfit I pulled from my fresh, new closet. Bring it on, fall! What a coincidence! I am in the middle of organizing my closet today too! I have decided that I need to do a deep clean once a month. That's doable, right? Um, right? this outfit is wonderful! You have inspired me to organize my closet for autumn. Yay! I love the feeling of just finishing a big organizational project. Closet, desk, giant cleaning - it's the greatest! I need to buckle down and get to ironing my clothes...I have waaaaay too many backed up, half wrinkly (but clean) clothing items in my closet that I keep reaching for in the morning before realizing they're not wearable. soo sad. I love this outfit you're wearing. The blouse is beautiful and the colors of the shorts and scarf are great. kudos on taking the initiative to get organized! I'm waiting on some new furniture to organize all my clothes... some are in my closet but some are also just in a big duffel bag on the floor! love this outfit and the scenary! cutest colour combo (especially that blouse for only 50 c! wow!) ever - yellow, blue and white! love it!!!! That is a really adorable shirt. It's not every girl who can pull off those victorian collars and ruffles, but you sure can! Love those boots with that blouse! And love the idea of pairing hose under shorts with boots! genius :) Great outfit! The yellow is the perfect touch! you could be in a magazine.. you look awesome and so photogenic (me jealous! :) I love this outfit.. the boots rock and the scarf works BIG TIME!! love this outfit! the sheer tights compliment the shirt. Love this outfit! The shirt and boots are perfection. You make shorts look so classy! 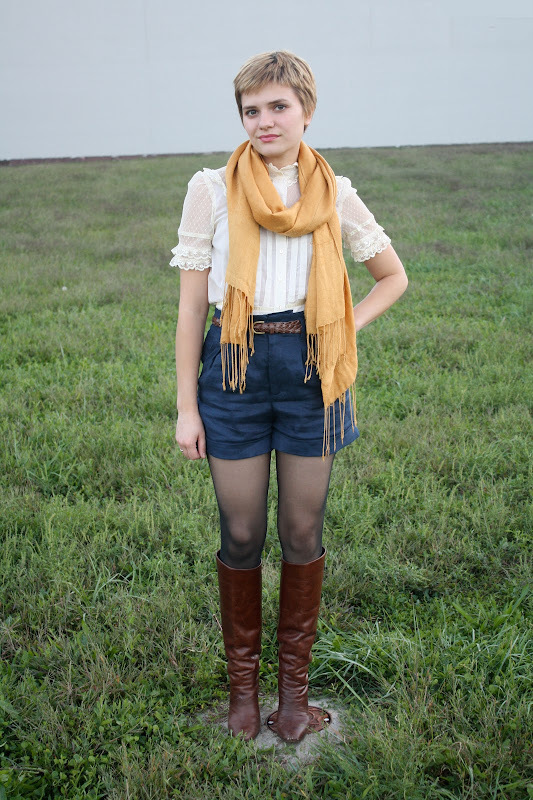 Love the boots so much, and this whole ensemble, paired with the field as your location, is just great! Ok, as I scrolled down this post, I loved this outfit more and more. The color combo is awesome, and I love all the different textures. What a fabulous start to a new season! You look AMAZING. The shorts/tight/boots combo is my favorite in cooler months. i'm a total mess when it comes to organization--but when i set out to organize something it can take me all day because i obsess over it... that's probably why i don't do it very often! I did the same thing! I moved everything that wasn't going to be worn in October...OUT. It definitely simplifies things in the morning and the clothes in the closet can breathe. those shorts are perfect. you have the best luck at forever 21! Great outfit! You look absolutely splendid. Ooh, an awesome beginning of fall outfit. I love that scarf!! Ooh! I love scarves, and your blouse is beautiful! That sounds exactly like me. As a virgo they say your an organized person and i can tell you right now I try so hard to be organized but my life takes over and I have no time to care. But ill let you know I'm a perfectionist and I fixate on everything. I'm actually in the middle of cleaning out my closet.